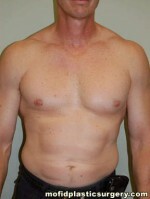 Patient from San Diego, came in to see Dr. Mofid to improve the size of his chest. 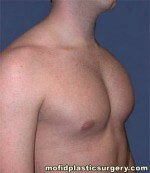 Dr. Mofid performed a pec augmentation using silicone implants to give the patient a better physique. 48 year old male with a right chest wall deformity 1 month after transaxillary placement of a right-sided custom male pectoral implant.